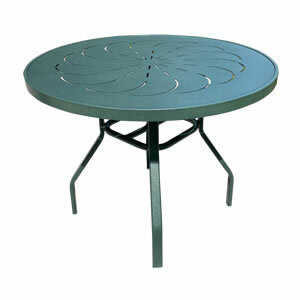 The PTR42 Flat Leg Aluminum Patio Dining Table is our premium outdoor table. The PTR42 has a 42-inch round diameter aluminum top that is available in 6 different punch top patterns. Made with a flat-leg base and a solid aluminum top, this table is the ultimate in style and performance. The PTR42's aluminum base and top may be powder-coated in an array of finishes and can be ordered with or without an umbrella hole. Pair the PTR42 aluminum patio dining table with any R-line furniture for a stunning presentation. Customize it today!